IT’s hauntingly fantastic! From the first to the last scene, the Stephen King adaptation directed by Andres Buschietti is nothing less than a horror masterpiece that does both the original novel and the TV mini series (1990) justice. The brilliance behind the adaptation is found in the excellent cast. So organic, so relatable. A common trope in King novels (and by extension the movie adaptation) is the tried and true narrative structure of the “coming of age” story. Although Stand By Me typifies the “coming of age” subgenre, IT may serve as a horror film for shock value on the outside; but beneath the nightmare-inducing exterior, beats the heart of a heavy drama with a great message about growing up, friendship, teamwork, and facing one’s fears. Few horror films reach iconic status, but this one is surely destined to be counted among films like: The Shining, Friday the 13th, Nightmare on Elm Street, Halloween, Texas Chainsaw Massacre and others. For all the previous King adaptations, Buschietti may have directed the best adaption we have ever seen. Kubrick’s The Shining may still win the award for most artistic and cinematic; however, 2017’s IT takes the words from the pages and successfully translates them to the silver screen along with impressive set design, special/practical effects, and a blood curdling score. Derry, Maine may seem like a picturesque idealistic version of Americana, but it has a problem. Every couple of decades, children and teenagers vanish without a trace. After Georgie disappears while playing with a paper boat in the rain, his brother Billy (Jaeden Lieberher) becomes determined to solve the mystery and find his brother. Met with opposition from his father, Billy teams up with his long-time friends Eddie (Jack Dylan Grazer), Richie (Finn Wolfhard), Stanley (Wyatt Oleff), and new friends Beverly (Sophia Lillis), Mike (Chosen Jacobs), and Ben (Jeremy Ray Taylor) to unravel the mystery surrounding the town of Derry. In their wildest nightmares, no one could have anticipated the evil that lies beneath the streets, in the dank sewers of the Maine hamlet. 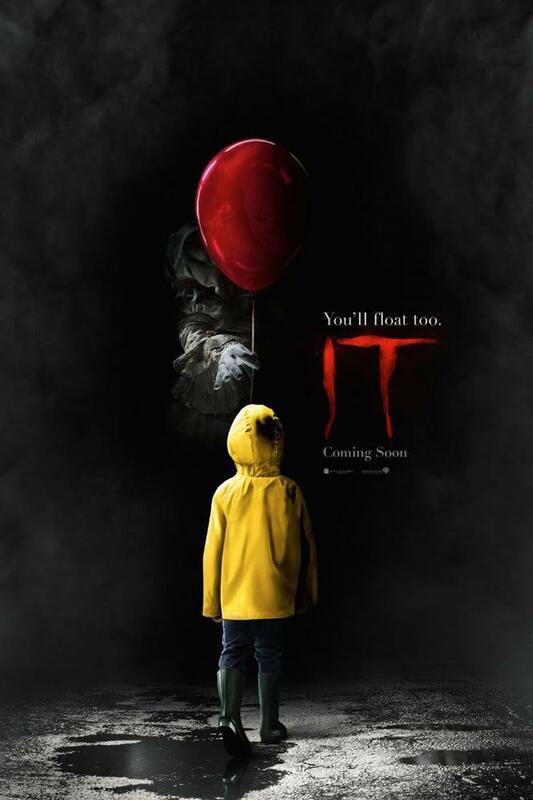 When faced with what terrifies each of them the most, the group of young people must band together in order to conquer their fears and destroy Pennywise, the evil dancing clown (Bill Skarsgard). The local movie theatre’s marquee displays Wes Craven’s A Nightmare on Elm Street 5; and the fact it is that particular film serves a more important purpose than simply to establish the period (which it does brilliantly, by the way). That particular movie is quite symbolic, and in many ways, parallels the events that unfold in Derry, Maine. Both Nightmare and IT take place in small towns; and furthermore, the ensemble cast is comprised of young people who must face fears and band together in order to conquer the evil that threatens their very lives. Although this version of Pennywise is a little less playful than the iconic original Tim Curry Pennywise, the dancing killer clown has a very Freddy Kruger quality about him. Many of the qualities that aid in (in my opinion) making Freddy the most terrifying of all the classic slashers and icons, is his playful attitude followed by moving in for the kill in a very showman way. Both Pennywise and Freddy are born out of and prey upon deep childhood fears and quite literally become the manifestation of the evil in the world. As such, there are many reasonable ways for IT: Chapter 1 to spawn several sequels in the same way that A Nightmare on Elm Street did. As nightmarish as the majority of the movie is, it does struggle here and there to connect all the scenes together whilst maintaining a solid rhythm. The overall sense of dread is carried through for the most part, but there are times that the film fails to increase the level of anxiety which could have been accomplished by spending more time in Derry’s history and the traumas and secrets that were buried over the decades. I would have liked to have seen the sewers that the kids search through be more symbolic of the very plumbing that transports the deep seeded fears that are ignored or flushed away by the people of Derry. IT certainly accomplishes its goal of being a high quality horror film but it falls short of going as deep as it could have. The overall experience of the film rivals that of other great horror films that have gained iconic status. Greatly contributing to this success is the balance between establishing nostalgic connections between it, the original IT, and the audience members, and the excellent 21st century hair-raising effects. The relatable cast seems to have been taken right out of Netflix’ Stranger Things, and will work wonders for attracting a younger audience who may not be familiar with the novel or original mini series. There are two films in IT: the horror film and dark drama. Both are well executed but have a few flaws in the nearly perfect recipe. It’s both a nostalgic coming-of-age story and a Wes Craven Freddy-like slasher. Having an ability to be a dark drama masquerading around as a horror film will do very nicely at the box office. Perhaps if this film were a little more like Nightmare and we saw a little less of Pennywise, he would be more terrifying. As it stands, the more we see Pennywise, the less scary he becomes. Still, he is pretty terrifying! Buschietti may not wind up with the same cache as Kubrick, Hitchcock, or Craven, but he has emulated much of what the aforementioned masters of suspense, terror, and horror pioneered many years ago. One thing’s for sure, this is a great way to kick off the Halloween season of films! After a mostly lackluster August, I am glad that the cinema is bustling with great films to see. IT this week, Mother next week, followed by the remake of Flatliners, September is shaping up to be a terrifyingly brilliant month for films. Should you choose to venture to Derry, Maine this weekend, you won’t be disappointed with the remake of a classic. If you really want to have some fun, bring along a friend who has a phobia of clowns.